1. Click the Email button as shown below. Include note text - If you have made no revisions to the note, you will see this check box as an option. Checking this box will attach the note information to the email. If this box is not checked, the recipient will receive an email with no note information attached. Include text from current revision - If the note you are emailing has been revised, checking this box will attach a copy of the current version of the note. 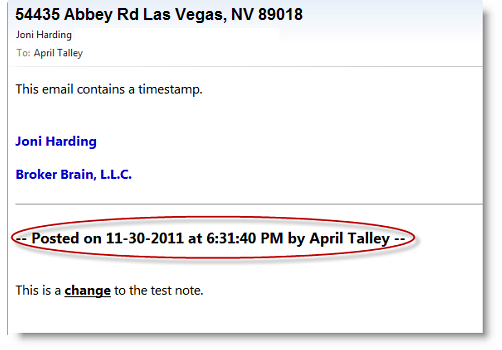 Include text from note on [date note was made] - If the note has been revised, there will be a check box with each revision date shown. Checking any of these will attach the older version of the note to the email. Checking all of these boxes will send a copy of each note revision, thus showing history of all changes. 3. If you would like to attach any property documents or photos that have been previously uploaded into Broker Brain, click the + next to Property Documents or Other Note Attachments. A list of available documents will appear. Click the check box next to the desired documents as shown below. 4. If you have additional documents you would like to attach , click the Browse button in the Additional Attachments section. Locate the desired document and double-click to select it. Click Add Another Attachment to add more. 5. When you have filled out the box completely, click the green Submit button. Your email will be sent, and a copy of your sent mail will be posted to the note.